And still they come! This is the third recording of Le Sacre to come my way for review this year, following on the heels of versions by Rattle (review) and Sokhiev (review). How many more will appear in this centenary year? [Quite a few by the look of it and we can start with Le sacre du printemps 100th Anniversary Collectors Edition. Ed.]. It’s appropriate that there should be a centenary contribution from the city where Le Sacre and, indeed, Pétrouchka were both heard for the first time. One thing that this Gatti version of Le Sacre has got going for it is the quality of the recording. I’m not sure where in Paris the recording was made - no further information is given in the booklet - but the engineers have produced a recording that has impact and body and which reveals a considerable amount of inner detail without, I feel, any unnatural spotlighting. Those comments apply equally to the recording of Pétrouchka, by the way. I approve of Sony’s presentation of Pétrouchka which is divided into 17 tracks. This makes it very easy not only to access certain points for comparison if one so wishes but also easy to follow the story. Le Sacre is divided into 14 tracks. The playing in both works is very good indeed, as is only to be expected nowadays in what have become standard repertoire pieces. I enjoyed Gatti’s account of Pétrouchka without being bowled over by it - and, indeed, that’s a comment that applies equally to his version of Le Sacre. There’s plenty of colour in Pétrouchka and right at the start the depiction of the Shrovetide Fair is vibrant and colourful with crisp rhythms. When Stravinsky later takes us back to the fair his Technicolour scoring is conveyed very successfully. A different aspect of colour is presented in the Moor’s Room scene, where Gatti conveys the sinister ambience successfully. He’s also good at illustrating the bear, which is portrayed with suitably grotesque heaviness, and he does the poignancy of Pétrouchka’s demise well. Some listeners may be troubled by occasions when the pacing is on the steady side. An early example of this is the flute solo at the start of the Conjuring Trick episode; here I’ve written in my notes “unhurried”. Gatti takes the Russian Dance at quite a steady speed though, to my ears at least, he still manages to put life into the music. Some may think his pacing of the Second Tableau, in Pétrouchka’s room, is too steady at times - and I don’t feel that the pace picks up as it should at 3:01 in this episode. However, he does characterise the music well and I like the amount of detail that one can hear. Overall this is a good account of the score but it does come across - unintentionally - as a bit safe at times and while I got a lot out of listening to it other conductors have found more vibrancy and drama in this wonderful score. In many ways the same considerations apply to Le Sacre. The performance has much to commend it though some listeners may feel it’s a bit steady. At times the performance has impressive power: there’s explosive percussion and tight brass playing in ‘Danse de la terre’, for example. ‘Rondes printanières also impressed me; it starts off in a calm, measured way before the explosion at 1:58, which is potent and menacing, while a little later in the section the brass glissandi have great power and there’s particular strength in the bass registers of the orchestra. The Introduction to Part II is atmospheric if, perhaps, a little too measured. The music in ‘Glorification de l’Élue’ is forceful and dramatic while the concluding ‘Danse sacrale’ is weighty and powerful; it may strike some people as a bit deliberate in pacing but the relentless savagery comes through. 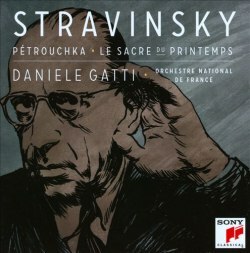 I admire a great deal about Gatti’s performance but I couldn’t escape the feeling that other versions have better conveyed the primitive savagery of Stravinsky’s masterpiece - or have done so in a different way. This is a disc that I’m sure I’ll return to in the future for it reveals a lot about both scores though Gatti doesn’t by any means have the last word on either. Stephen Walsh contributes a good booklet essay.